February 2005, Volume 2 Issue 2 Know It - Profit! This month I introduce the Relative Strength Index as a powerful tool for picking entry and exit points. Once you've seen it in action, you'll never trade without it! Let's see which sectors are on the move. You're probably benefiting from one of them, right now! Using the relative strength comparison method, I pulled together a short list of the strongest sectors. This month's sectors include: healthcare payor, housing, disk drive and the internet. The AMEX Healthcare Payor is in a strong up-trend... but, after a thorough check-up, it was showing signs of topping-out. 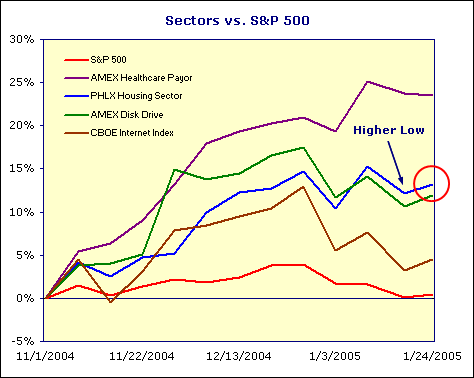 The PHLX Housing Sector, AMEX Disk Drive and CBOE Internet indices are showing sustained growth. 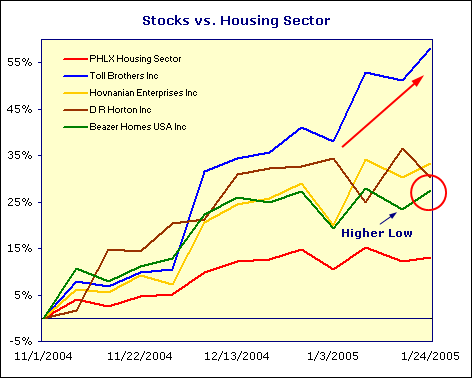 However, only the housing sector is hinting at moving higher... building a foundation on its higher lows. There are 21 component stocks which make up the PHLX Housing Sector. I was able to select the four strongest stocks after applying the relative strength comparison method... just like I did with the indices. 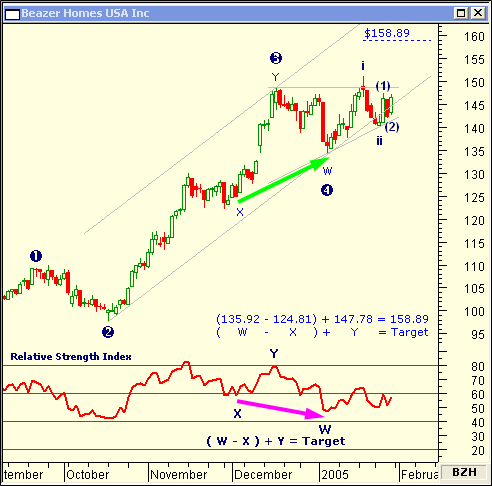 Toll Brothers Inc (TOL) is up sharply... over 58 percent for the period. But, it's a little lofty. Hovnanian Enterprises Inc (HOV) and D R Horton Inc (DHI) are also performing well -- up 30 to 33 percent. DHI may be forming a bearish double top. And, just like its index, Beazer Homes USA Inc (BZH) is marking higher lows on the relative comparison chart. It's up 27 percent. Beazer Homes USA Inc (BZH) appears to be in a better position to move higher. First, BZH has been consolidating in an ascending triangle since mid-December. Like a compressed spring, the stock is building-up energy which could propel it above $150. Next, the Elliott Wave pattern shows there's plenty of growth left in the major fifth wave up. Also, the Relative Strength Index (RSI) is showing the best evidence a sustainable upward movement is right around the corner. Oscillating between 80 and 40, the RSI confirms the bullish trend. And finally, as an added bonus, the RSI Positive Divergence which formed in December and January is pointing to a near-term $15 gain! In the December 2004 issue of Chart Wealth, I set a price objective of $83 for EOG Resources Inc (EOG). Well, it's been a bumpy ride and we're still $9 away. In fact, an A-B-C correction unfolded and EOG (View Chart) broke-down out of the up-trending channel. You even may have entered a trade on 12/8/2004 using the piercing line candlestick pattern as your entry signal. With a trading plan, you would have used the up-trending channel as a moving stop... and, have been safely stopped-out with a small profit. The Relative Strength Index is an often underutilized tool you can use to confirm other trading signals... as well as, set price objectives. Even though the RSI gives great trading signals, never use it in isolation.